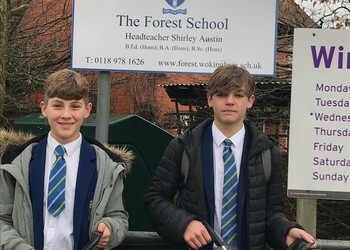 Students from The Forest School are currently taking part in the Bronze Duke of Edinburgh programme.The Bronze DoE programme consists of 4 sections, Volunteering, Physical, Skills and Expedition. Students complete a minimum of 3 months volunteering, doing a physical and skill based activity, and take part in an expedition. This year several of our students have chosen to 'litter pick' as part of their volunteering section. 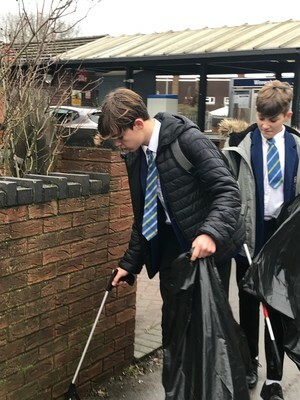 Each day, at break time, students collect black bin bags and litter picking sticks and go and pick up litter. They work in the school grounds and on the footpaths located close to school. Today was no exception, two DofE students, Zac and Jonny, accompanied by a member of staff, picked up litter along Robin Hood Road. When asked why they had chosen this for the volunteering section of their DofE they said, "It's a good thing to keep your environment clean, we should respect our environment. 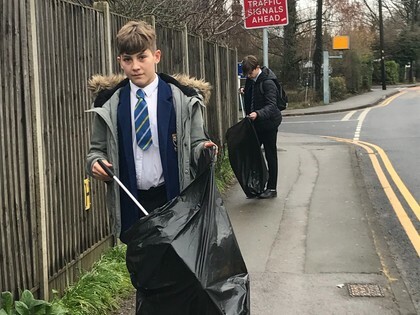 We're happy to keep our school and local community litter free."